I had planned this portrait session pretty well. My gear was all organized, I had the props I was bringing, it was a beautiful sunlit day (not that I planned that part!)... Everything would come together, I'd find a beautiful spot in my client's home to shoot, and we'd end up with beautiful portraits of their newborn son. We spent a total of three hours together, only about 20 minutes of which was spent setting up. The rest of the time we rocked and sang to a very unhappy little boy, trying to get him to sleep. Once or twice it did happen, but as soon as we put him down for the shoot, he woke right up and started crying again. We did have a fun time together, talking, even playing with their spunky two-year-old daughter. In the end, I snapped a few photos and called it a day. But, their little girl, Josie, decided that my set-up with the background and basket and everything was just for her. 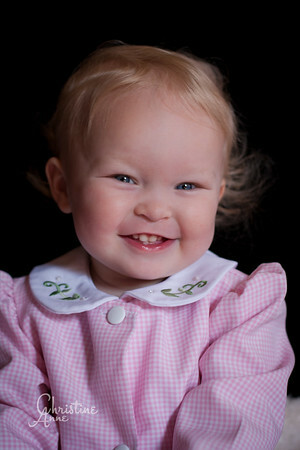 So she made herself at home, and what started as a newborn portrait session turned into a mini toddler session! Josie is a happy little girl who loves to be busy and playful around the house, and I caught a couple of cute images of her playtime with me. Enjoy these images of what happens when things don't go as you've planned them to go.